It’s so much more than flying a rainbow flag… but if you do it’s always red at the top! 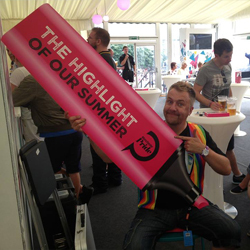 Andy is a local guy who has been involved with organising Pride related events in Hull for several years. 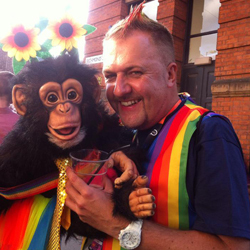 He joined the Hull & East Riding LGBT Forum when he came out in 2002 and is a Pride regular in Bradford, Manchester and Gran Canaria. 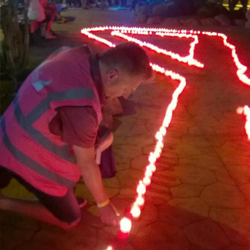 Andy has worked at the last 2 Prides that I have been involved in here in Gran Canaria and I have been impressed with his dedication to providing the best possible service to the visitors whilst fitting seamlessly to our existing security and first aid structure. His main strength is his ability to just be out there and doing whatever is necessary without the need for any supervision from us. We know that when he is working, we have one less problem to worry about as he has an amazing ability to deal with almost any situation with sensitivity and professionalism. The first Pride event was held back in 2002, that first event, in Queen’s Gardens, and was much smaller, with the intention to bring together the LGBT community of Hull in a fun, welcoming environment. It also included a more politically orientated means of protest and a march. More recently, we have focussed more on celebration and integration. Those first few years were a huge success, well beyond the expectations of the organisers, and it eventually became necessary to move to a bigger venue away from the city centre. First Pearson Park, then West Park. Since then, the core Pride event in Hull, has continued to go from strength to strength culminating in the 2010 event which saw 10,000 people attending throughout the day. 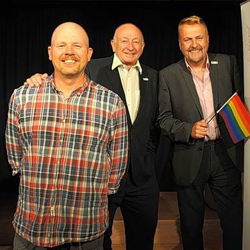 September 2014 saw the newly formed Pride in Hull (Hull LGBT+ Community Pride) Team hold Hull & East Yorkshire’s first ever LGBT+ Film festival, which was a big success. Pride in Hull (of which Andy is a Trustee) has big ambitions for its future, especially leading up to the Hull City of Culture celebrations in 2017! It made me feel much more comfortable about talking to learners who are LGBT . After his talk I felt less worried about offending learners struggling with their sexual identity and understand some of the issues they face which may impact on their behaviour and attitude in college. I think these kind of talks definitely need to continue to happen in colleges. Andy is a great speaker and does a fabulous job!